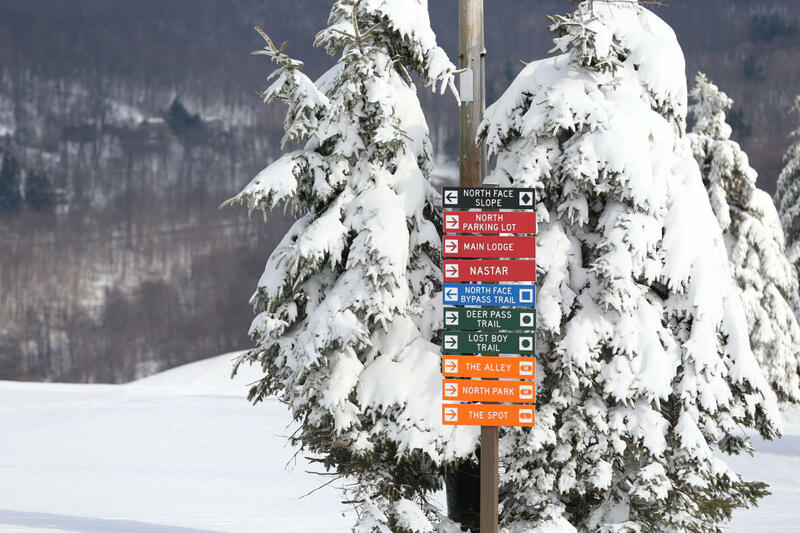 LAUREL HIGHLANDS, Pa. (Dec. 14, 2017) – If you have been longing for powder days, first tracks and a winter getaway, look no further than Pennsylvania’s Laurel Highlands. In the last two days, the region has received more than 6 inches of natural snow and cold temperatures to help area ski resorts with prolific snowmaking. The arrival of natural snow and cold temperatures has winter sports enthusiasts wondering which of their favorite resorts are open, when will they open, what’s new and when to make getaway plans. The state&apos;s largest resort, Seven Springs began snowmaking in early November and opened for weekend-only skiing and snowboarding after Thanksgiving. This summer, 66 HKD tower snow guns and six portable snow guns were added to Seven Springs’ extensive armada of snowmaking equipment. A new fleet of Rossignol children’s skis and boots and Burton snowboards and boots were added to the rental shop. Nighttime ski enthusiasts can look forward to a new night ticket this year, available Sundays through Thursdays, from 4-9 p.m.
Off-mountain improvements include complete renovations to the Center Lobby and Bavarian Lounge, as well as hotel room renovations featuring remodeled bathrooms, new carpeting, new paint, new furnishings and upgraded bedding and amenities. Check out this loaded lodging offer if you’re planning a family getaway – two nights lodging, unlimited skiing, snow tubing, breakfast, bowling, mini golf, dining credit, family pizza dinner, and more. Plus two kids ages 12 and under stay and play for FREE! For more info or to book online, visit www.7springs.com/package/winter-family-memories/. A favorite of families with small children and beginner skiers and snowboarders of all ages, Hidden Valley also began snowmaking in early November. Over the summer, the resort tweaked snowmaking infrastructure to boost its snowmaking power and enhance efficiency. Adults and kids can ski or snowboard 4-9 p.m. and pick up rental equipment on Fridays for only $45. Add on a one-hour group lesson for $20. More details online here, www.laurelmountainski.com/ski-ride/special-offers/. An ideal learning environment for first-time skiers and snowboarders, Mystic Mountain will offer extended operating hours for the coming season with slopes and trails open Thursdays through Sundays and snow tubing open five days per week. Make a midweek escape to Nemacolin’s Mystic Mountain and explore all the luxurious resort has to offer with the Playground Rate for select dates through spring 2018. For more info or to make reservations, visit www.nemacolin.com/specials-packages/overnight-experiences#playground-rate. While the Laurel Highlands offers incredible skiing and snowboarding, there’s more winter fun to be had including dog sledding, horse-drawn sleigh rides, snow tubing, snowshoeing, snowmobiling, cross-country skiing, luxurious spas, sporting clays, winter festivals and events and much, much more. Want to learn more? Follow the Laurel Highlands blog for regular updates and even more story ideas. A magnificent mountainous region, the Laurel Highlands spans 3,000 square miles in southwestern Pennsylvania. Located just east of Pittsburgh, the beautiful four-season destination offers some of the most spectacular natural scenery, outstanding outdoor recreation, historic sites and attractions, classic family activities and world-class resorts. Notable destinations within the region include three architectural masterpieces by Frank Lloyd Wright – Fallingwater, Kentuck Knob, and Duncan House – Seven Springs Mountain Resort, Nemacolin Woodlands Resort, Flight 93 National Memorial, Idlewild and Soak Zone, whitewater rafting at Ohiopyle State Park and more. Visitors to the Laurel Highlands can find information online at www.LaurelHighlands.org, calling 800.333.5661, www.facebook.com/LaurelHighlandsPA and www.twitter.com/LaurelHighlands. Established in 1958, the Laurel Highlands Visitors Bureau is the official destination marketing organization for Fayette, Somerset and Westmoreland counties in southwestern Pennsylvania. Check out the 2017 Laurel Highlands Destination Guide!